Do you currently use Data Visualization software? Data visualization software describes any computerized tool designed to interpret complicated data sets, identify trends, and give users a way to track performance at a glance. Modern dashboards use data visualization to improve the user experience of traditional business intelligence. Insight from business intelligence programs can be difficult to digest in numerical form. Visual representations help people comprehend such information, and encourage a wider range of insight. The primary distinction between data visualization software and a full-blown business intelligence (BI) solution is the quality of the visualizations one can produce. Some BI solutions, though excellent at crunching the numbers according to your data analysts’ specifications, fall short of allowing you to present your results to others. Sometimes a number chart or bar graph just doesn’t cut it. Producing interactive visuals that complements a business intelligence report is what the best data visualization software specialize in. This guide covers the factors one should consider when attempting to select and implement the best data visualization tools for their business. There are a number of scenarios in which you may be considering adding a data visualization tool to your BI arsenal. You may be looking to implement a new BI solution and are aware of a particular need for quality, integrated visualization and reporting functionalities. In this case, you may want to pursue a fully capable business intelligence solution. However, keep in mind the considerations listed below to ensure that the solution’s visualization tools will be sufficient. In a second scenario, you may already have a BI solution, but it might lack sufficient visualization capabilities. In this case you’ll want data visualization software that can integrate with your existing BI program, and enhance your project. The last scenario is that you have no BI software, and you feel that a full-blown BI solution is overkill. Some of the best data visualization tools come with enough data mining and analysis functionality to create the visualizations you want directly from the data, allowing you to manipulate it for insight much like a broader BI program. Which Data Visualization software is right for your business? If your data visualization tool is not overlaying a BI system, but is functioning as your primary BI solution, then it is very important to ensure that it will connect smoothly with your data sources. Your data may be stored in a relational data warehouse, a Hadoop cluster, NoSQL, or a cloud-based system. Not all visualization solutions have pre-built integrations, and if your data system is custom built, you will want to check if your selected solution can be easily configured to integrate with it. The best visualizations are dynamic, and allow you to peer deeper into and manipulate the data in real time. In a timeline visualization, this could be a slider empowering you to go at your own pace through time to observe how changes in one metric relate to the changes in others. In a geographic map this may be zooming in from the world map to a state level or city map and comparing the distribution of your data points in one city to the distribution of data points in another city. This is what elevates visualizations from mere reports. Visualizations allow non-technical users to generate actionable insight. There are many visualization types. Different charts, graphs and infographics abound, and it is worthwhile to peruse the various types provided by your potential solution. Treemaps, streamgraphs, bubble charts, infographics, geographic maps and three-dimensional scatter plots are all commonly referenced and are a good place to start when making sure the solution has all the standard visualization templates. Pre-built templates can speed up the process of creating reports and lighten the load on your data analysts. With so many options, however, it would be easy to get caught up in using every visualization you can find. 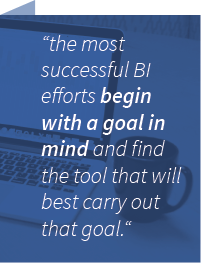 Remember, the most successful BI efforts begin with a goal in mind and find the tool that will best carry out that goal. It’s good to research your best options beforehand and identify which visualization types are likely to work best with your data. Whether your visualization solution will be part of a broader BI system or not, you’ll want the ability to include your visualization in a dashboard. Having the right visualizations and reports collected in one quickly accessible location helps minimize the time from analysis to action. The case study under the header “Data Visualization in Use” describes a company’s implementation of individualized dashboards for each manager based on the key performance indicators most relevant to their decision making. Mobile access allows you to view your visualizations and data through any internet connected device. Whether out of the office, at a meeting, or simply around the workplace, mobile access to current visualizations allows you to make real-time, data-driven decisions.This can come in the form of a mobile app or a mobile optimized web portal for Internet-enabled devices. Beyond personal convenience, mobile access makes data easier to retrieve for everyone, ensuring more decision makers are properly informed. Self-serviceability is the degree to which a non-technical business user can operate the data visualization software. If it is necessary for a business executive or manager to access and even generate their own visualizations, then the software must have a clean, self-explanatory interface. This could include a drag and drop interface, or pre-built analysis features. If you can’t meet your needs with a self-service solution, you will want to ensure that the provider you choose supplies sufficient training resources and support, so your analysts can work as efficiently as possible. Assistance offered by data visualization providers is often available in the form of video tutorials, live online introductory sessions, and/or onsite training. The right type of training for your company will depend on the capabilities of your IT department and your other users. You may need to have a large, in-person training session for your business users, or you may need only some online reference materials for your already skilled IT personnel. Which will be the best data visualization tools is dependent on the decision between a cloud or on-premise solution, which rests largely on the location of your data and your existing BI infrastructure. Speed of deployment is usually quicker for data visualization than for other BI tools, so current systems and security are more applicable factors to consider. If both your data and BI solution are in the cloud, then you will want a cloud-based visualization solution capable of integrating with the particular cloud systems already in use. Otherwise, if your data sources and BI solution are on-premise due to security or dependability concerns, then your visualization software likely should be on-premise as well. As far as security, your visualizations may contain company data that shouldn’t fall into the hands of your competitors. Like with any sensitive information, you must consider the security of your servers, the servers of any cloud-based provider, your workplace computers, and mobile devices when selecting a visualization solution. Eurac, an international brake disc manufacturer, needed a better way to create and view reports. Eurac produces 100,000 tonnes of grey iron casting each year and operates machining facilities across the world, supplying vehicle manufacturers, the motor racing industry, and part distributors. An enterprise resource planning (ERP) system implemented by Eurac in 2011 failed to produce reports frequently (taking up to two weeks or a month to produce) and the reports required technically skilled staff to be customized. After a successful free trial tasked to an IT intern, Eurac implemented a Logi Info, a Logi Analytics data visualization and dashboarding solution. Now Eurac managers have access to real-time reports on dashboards personalized to the key performance indicators (KPIs) most relevant to their department. They can react to situations as they occur. They can access the reports from their laptop, tablet, and mobile phone, in the workplace or out. No longer do they have to wait for weeks to see progress reports and to make changes to the reports they receive. 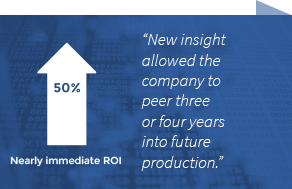 The benefits provided by Logi Analytics have resulted in a nearly immediate 50 percent return on investment for Eurac, partly due to the reduction in ERP licenses required. Decisions were made quicker, and new insight allowed the company to peer three or four years into future production, all by giving managers efficient access to quality reports.